If you love authentic mexican food you should look away now, or better still check out Lily’s blog. Right, for those of you who are still here and enjoy a tasty light meal that’s on the table in minutes read on. Today I had a lovely lunch with Julie, who has recently started a very popular blog on cooking chinese food, so I just wanted a light meal when I got home. 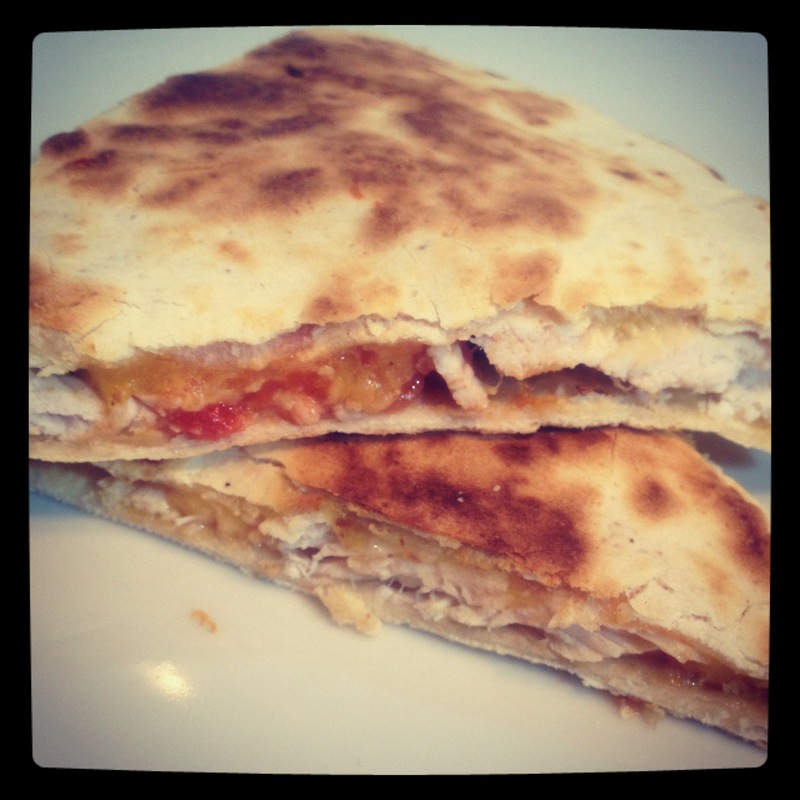 I had roasted a chicken last night so I was just going to have a sandwich when I had a lightbulb moment- Quesadillas! Quesadillas are like a fancy toastie, just two tortillas (we tend to call them wraps these days) dry fried on a pan with a tasty savoury filling. I always have wraps in the press as the boys love them in their lunchboxes, I had the roasted chicken and some cheese, and the key ingredient a jar of shop bought salsa (shock horror). In under ten minutes I was tucking in. I haven’t given quantities for the ingredients because really it’s to your own taste, so get inventive, add jalapenos, peppers, corn whatever you feel like. Place one tortilla on the pan (off the heat). Put the chicken on top, as much or little as you like. Then, dot salsa over the chicken, and sour cream or mayo on top of that and then cover in grated cheese. Put the second tortilla on top and press down. Then put the uncooked quesadilla on the pan (as long as your pan is non stick you don’t need any oil) and cook over a moderate heat for about three minutes, then flip and repeat. Then it’s done. I like to chop mine into triangles like it’s a slice of cake. You could serve with salad or wedges or just by itself. I ate nearly the whole thing unaccompanied (don’t judge me). It’s a great snack to share too as the slices can be put out like slices of cake and you can eat it with your hands. easy, light, mexican, quick, recipes. Bookmark.